Sitting by itself among the desert hills south of Payson is Black Mountain, a dome of black volcanic rock that can be seen for miles. On top of this natural fortress is a 13th century Salado ruin, described in Dave Wilson's book "Hiking Ruins Seldom Seen". 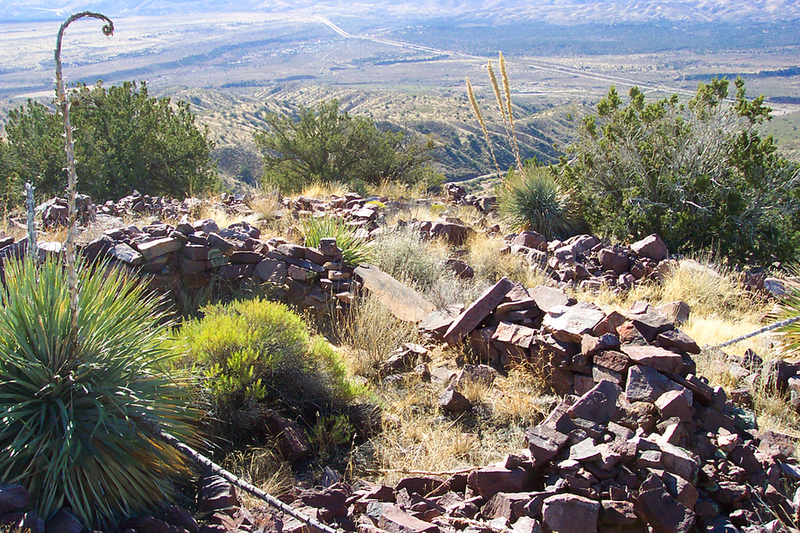 The ruins atop Black Mountain are one link in a long chain of hilltop ruins stretching from the East Verde River on the north to the Salt River on the south. This short hike consists of off trail scrambling through the desert vegetation on steep terrain, and makes for an enjoyable outing during the cooler months of the year. Choose a parking spot along side the Gisela Road near the base of Black Mountain to begin your hike. From my parking spot along the road, I began following a 4x4 track down slope to the bottom of Black Mountain Wash. A brief hunt for petroglyphs or other signs of ancient cultures along the low rocky walls of Black Mountain Wash yielded nothing, so I moved on to the hike itself. After a brief visual study of the topography, I began bushwhacking up the southwestern side of Black Mountain. Picking my way through the plentiful cacti and mesquites on the steep, rocky mountain side, I soon arrived at an area of volcanic bedrock near the top that overlooked the north slope of Black Mountain. At this point, I came across an established path that led southwest through the juniper trees to the actual summit of the mountain. Upon reaching the top of Black Mountain, man made walls of purplish volcanic rock started to appear. From this vantage point, I surveyed the rest of the rock walled fortress spread out among the juniper trees along the cone shaped mountain top. There are quite a few rooms up here, some in better condition than others, with most having walls no higher than four feet. Other hilltop ruins that I had explored were visible in the distance from this isolated peak. I spent some time exploring the various rooms of the ruin, enjoying the views of the surrounding mountains, and trying to find a location to capture a good image of the ruin in its entirety (no luck for me-bring a wide angle lens!) Soon it was time to go, so I began the hike back to my truck. After a 600 foot descent of sliding and stumbling down loose rock, I arrived at my truck with another fine adventure under my belt. From Payson, head south on AZ highway 87 approximately 11 miles to the signed Gisela turnoff. Follow the paved Gisela road east about 1.7 miles to the base of Black Mountain (the big hill on your left). There are a few pulloff areas along the Gisela road in this area, pick one and start hiking.